St. Boniface Church at 1358 W. Chestnut St.
NOBLE SQUARE — Preservationists rushed to St. Boniface Church on Monday after spotting demolition crews preparing to raze the century-old structure at the northeast corner of Noble and Chestnut streets. The crews from Riverside-based wreckers Crunch Inc. were at the site just as Brian Duggan, an executive with Guardian Capital, bought $1.4 million worth of debt that the building's owner, Phil Moeller, owes to Forest Park Bank. Duggan's Downtown-based development firm now has a financial stake in the church, Moeller confirmed. The church was not demolished on Monday. "Our primary objective is to enter into an agreement with a developer ready and able to preserve the church structure," Moeller said on Tuesday. "Absent this, we will have no choice but to allow Guardian and the bank to move forward with the demolition of the church and the development of market rate housing." Over the weekend, those fighting to save the church at 1358 W. Chestnut St. were assured that there would be no demolition, despite a permit having been issued on Friday. A temporary hold has been placed on the demolition permit by the city as negotiations are ongoing, the Dept. of Buildings confirmed Tuesday. In a statement, Peter Strazzabosco, deputy commissioner of the Chicago Department of Planning and Development, acknowledged Guardian Capital's financial interest in the church. "The city continues to work with the owner, financial interests and potential developers on a viable plan that re-uses the church building," Strazzabosco said. "Demolition will not be occurring during this ongoing negotiation period." Several calls and emails to Duggan were not returned. A Forest Park Bank official who sold the debt to Guardian Capital did not return calls. A source close to the project said that Duggan views the church primarily as a land opportunity. Elsewhere in the area, Guardian Capital is building 50 townhomes in Logan Square and eight single-family homes in the 2000 block of West Race Street in West Town. Ward Miller, executive director of Preservation Chicago, an advocacy group that has been fighting to preserve the church, said that Guardian Capital's entry into the equation came unexpectedly. "It was a huge surprise and disappointment to a lot of us today," Miller said of the buyout. 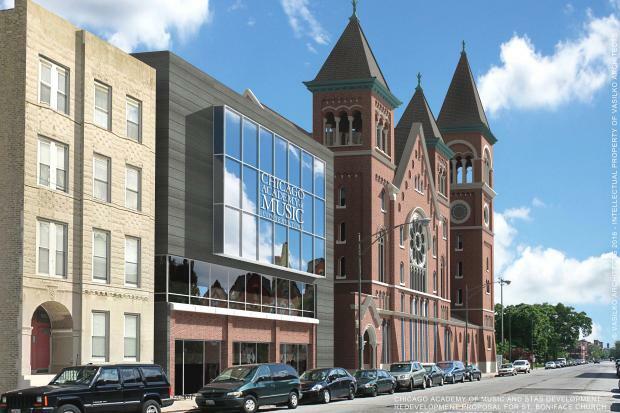 For the last five months, builder Michael Skoulsky from Wicker Park-based Stas Development has been seeking to transform the church into a campus for the Chicago Academy of Music. Skoulsky's plans include creating 15 condos inside the church and 19 to 22 condos in a new four-story structure on Chestnut Street. The plans also call for a four-story building on the Noble Street side that would include two small commercial units and music classrooms on the first floor, eight studio apartments for academy use on the second floor and a small auditorium on the third and fourth floors. On Monday, Skoulsky said that he had been working with his lawyer to buy the debt from Forest Park Bank; however, the conditions of the nonrefundable contract needed to be more carefully examined before he committed to it, he said. Though Moeller owns the title to the church, his mortgage is in default, county records show. Skoulsky said he believed in the church's longevity and wanted to preserve it. "What's built 100 years ago cannot be recreated. It's just like in Europe, it was here for 100 years and it should be here for 1,000 more," Skoulsky said. Michael Vasilko, an architect who is working with Skoulsky, was among those who rushed to the site on Monday. "As of Friday, everything was cool, but as of today everything is not so cool," Vasilko said. Vasilko created a rendering that shows what he has planned for the church, provided that Skoulsky is the one tapped to renovate it. 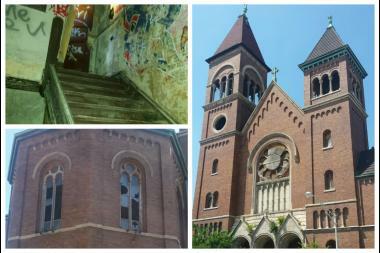 Earlier this year, city officials told Moeller that he must either repair the dilapidated church or demolish it.